Sedan (Happy), Jack Smart (Bashful), Lou Merrill (Sleepy), Paula Winslowe (Queen) and Gloria Gordon (Witch). Toy Story 2: Special Edition, a 2-disc DVD package, is released. Walt Disney receives a telegram from New York cartoon distributor Margaret Winkler stating that she has received his Alice Comedy Alice's Day at Sea. Disney's Oswald the Lucky Rabbit short Rickety Gin is released. customer to enter the Anaheim park! Mickey Mouse Club airs on ABC-TV. Today is Fun With Music Day. ABC-TV's Disneyland series airs the episode "Searching for Nature's Mysteries." Disney's TV pilot "Family Values" airs. hailed on CBS-TV's "The Kennedy Center Honors." dies at age 72 after battling cancer for a year-and-a-half. Florida Governor Jeb Bush & his parents, former President George Bush & former first lady Barbara Bush, board the Disney Wonder for a 3-night cruise. California Adventure park at the Disneyland Resort. newest Belle and Gaston in Disney's Beauty and the Beast. overall) will meet in the 93rd Rose Bowl game played in Pasadena on New Year's Day. Disneyland welcomes 2008 Rose Bowl contenders Illinois and Southern California football teams for a special celebration. Disney's animated Peter Pan is released in Denmark and Norway. released. The first short in which Goofy is shown to have multiple duplicates, he defends himself through a history of the "manly arts." Starting with scientific conditioning, Goofy, in typical "how to" fashion, demonstrates everything from shadow boxing to jump roping, before a big night in the boxing ring. Disney's Pluto short Pluto's Blue Note, directed by Charles Nichols, is released. Pluto loves to sing ... but no one wants to listen! ABC-TV's Zorro series debuts the episode "Zorro, Luckiest Swordsman Alive." Disney's Mars and Beyond is released as a 49-minute "mini-feature" to theaters. First televised on ABC on December 4, it is directed by animator Ward Kimball. television series running on the BBC since 1970. Comic & character actor Don Barclay, the voice of the Doorman in Disney's 1950 animated classic Cinderella, is born in Ashland, Oregon. Barclay's Disney credits include Mary Poppins, One Hundred and One Dalmatians, Peter Pan, and Alice in Wonderland. Aside from being a talented comic/character actor, Barclay was also a cartoonist who enjoyed drawing caractures. The twenty-third episode of Disney's Recess, "Yes, Mikey, Santa Does Shave"
around Mikey ... the only fourth grader who still believes in Santa Claus. 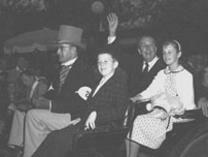 Roses President, Mike Matthiessen, Mickey Mouse, and Disneyland Resort President Michael Colglazier. The teams will play in the 102nd Rose Bowl Game on Friday, January 1, 2016. Bear. Today he is best known as the co-director of Bolt, Tangled, and Zootopia. David Lowery, filmmaker, director, writer and editor, is born in Milwaukee, Wisconsin. loosely based on the same original story as the Disney 1977 musical of the same name. Butterfly on the Disney XD/Disney Channel original animated series Star vs. the Forces of Evil.